Nottinghamshire’s bowlers produced an impressive performance on the second day of the First-Class match against Cambridge MCCU at Fenner’s. Jake Ball and Samit Patel each bagged three wickets, as did Luke Wood, who took three for 31. Wood’s career best figures of five for 40 came against the same opposition in 2017 and he relished the opportunity of taking the new ball alongside Ball. The all-rounder was undefeated on 19 when the Nottinghamshire first innings closed on a colossal 565. Then he produced impressive spells at the start and finish of the Light Blues’ innings. “Sometimes for a bowler it’s all about when it clicks really and the stage of the game. The ball wasn’t really doing a lot today, especially towards the end, so I was trying to slam it in a bit harder,” he said. The current Notts squad is brimming with talent and Wood says that can only be a good thing, with so many options. “We’ve got a lot of good players at the moment, so its never easy to know if you’re in or if you’re out. It’s a nice place to be, in a way, because I know I’m valued within the group, the ‘cartel’ for what I bring," said Wood. "It’s always going to be difficult with the likes of Patto, Broady and Bally being around but I’ve got to make sure I’m ready for when I’m needed. 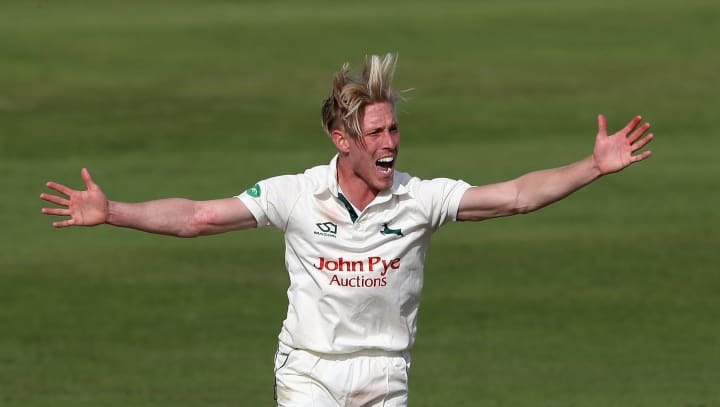 When he burst into the Notts ranks it seemed as if Wood was going to be a long-term occupant of the number eight slot but he reflects there are so many around who could do that job within the current set-up. “It’s the way cricket has gone. You look at a lot of the bowlers these days and they can all bat. Sometimes you can get a side down to number eleven and you’ll find he can hold the bat as well as a number nine," he said. Despite Notts not featuring on the winner’s rostrums last year, the Sheffield-born all-rounder did manage to pick up a medal, courtesy of a short loan spell. He joined Worcestershire for their T20 campaign and helped the Pears to their first title in the format; an experience he’ll never forget. “It opens your eyes somewhat because you only ever see the one side of cricket normally," he said. Whilst many in the squad travelled the globe in search of cricket this winter, Wood stayed at home – working hard on his game. “I was grafting in the inside shed, it was my preference really, not to go away. I quite like to work hard on my batting, so I did a lot of that with Mooresy and Franksy and worked with Picky on my bowling, so I worked on a few aspects of my game that have gone well since we started back outside," he said. His performance today is sure to earn him a mention when it comes to selecting a side for the weekend but the lefty knows there are several in contention for so few places. “I’d love to play against Yorkshire but you can’t beat yourself up if you’re not selected. I don’t tend to think too far ahead and just try and take things in my stride but if I’m selected I’ll be ready," he said.